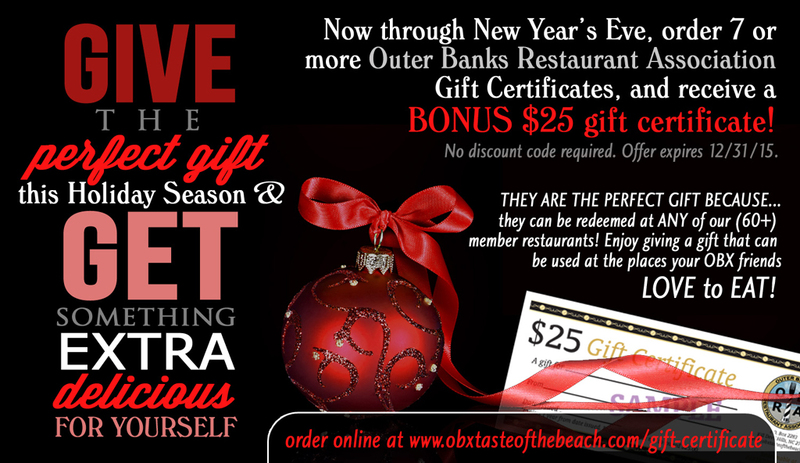 An Outer Banks Restaurant Association Gift Certificate is a great way to show your appreciation to someone. Whether it is for a birthday, or holiday, or just a thank you for a job well done, if you know someone that frequents the Outer Banks area, rest assured you will be giving them a gift they will really appreciate and use. The best thing about OBRA gift certificates is that they can be redeemed at any of the OBRA’s member restaurants, so that gives the holder over 60 choices of great places to eat on the Outer Banks. It’s the perfect gift for that OBX loving friend! No discount code is needed. For every qualifying order (of 7 or more certificates) we will include the 8th one as a bonus! But only on orders placed by midnight on 12/31/15. Each OBRA Restaurant Gift Certificate comes in increments of $25.00. You may buy as many as you like, and the bearer may redeem as many as they like at one time, at any of our current OBRA member restaurants (at time of redemption) within one year of issue date. For more information and to place your order just CLICK HERE to go to our certificate ordering page. We normally mail the certificates directly to you (the purchaser) so you may give them away at your discretion, but we will gladly mail them directly to your recipient with a note of explanation and recognition of you as the giver. Simply indicate their name and address on the order form when you complete your purchase. You can only enter one recipient name and address per order. We do not/cannot issue these gift certificates electronically. They currently only come the old-fashioned way, on paper, in an envelope, through USPS mail. If you are short on time to get these to your recipient, see the FAQs we have on the Gift Certificate ordering page.